"Before I left, I lit a candle and threw it in the chair. I never wanted to hurt my family. ... I just hope my family and friends and God can forgive me." Those words constitute the heart of Michael Ledford's spoken confession that he set fire to his apartment and was therefore responsible for the death of his one-year-old son and the serious burn injuries suffered by his wife. Though Michael recanted those words, and his entire confession, those are the words that convicted him of first-degree murder and spared him the death sentence. 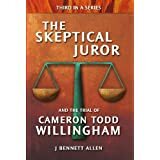 The jury believed both the part about starting the fire and the part about not meaning to hurt anyone. A confession is as good as a conviction, or quite nearly so. Those people who confess, recant, and then go to trial are almost always convicted. Jurors, i.e. the American people, simply cannot imagine themselves confessing to a heinous crime they did not commit. Since they cannot imagine they would do so, they will not believe anyone would do so. Jurors, i.e. the American public, are wrong on both counts. 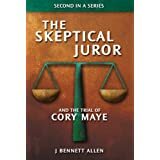 One completely logical, but amazingly ineffective means of convincing a jury that a confession is false is to show that the confession is inconsistent with the facts of the case. If the confession violates space, time, and thermodynamics, that's even better. It's better, but it's probably not good enough. During Michael's trial, the defense tried to show that Michael's confession was inconsistent with the data. They did a poor job of it, in my opinion, but they did make a try. I'll try to do better in this post. 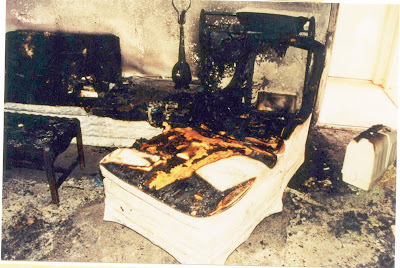 The photo below shows the chair into which Michael confessed to throwing a candle. The photo was taken on the same day as the fire. That day was Zachary Ledford's first birthday. 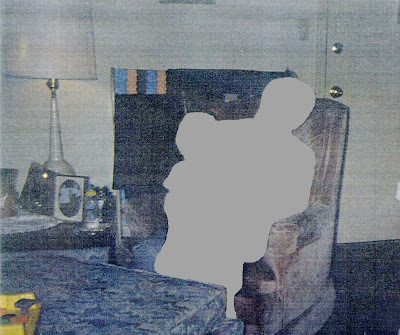 In the photo, Zachary is sitting in the lap of a family friend. I wish to intrude as little as possible into their privacy, even as I publicly discuss the most tragic portion of their lives, so I have redacted the people from the photo. Click to enlarge. Let's examine the photo carefully. We will soon compare it to a couple of photos taken after the fire to see what we can learn. The chair is an upholstered swivel rocker. Given that the fire occurred in Virginia in 1999, it is almost certain that the upholstery fabric was not fire-retardant. (My understanding is that California was the only state then requiring fire-retardant upholstery.) The cushions themselves consisted of polyurethane foam, a petroleum product. I've seen polyurethane referred to as solid gasoline. When burning it releases, among other gases, hydrogen cyanide and carbon monoxide. Both are deadly. There is an ottoman sitting in front of the chair. The ottoman burned but is not particularly relevant to the story. Behind the chair and at the right of the photo is the sole entry door to the apartment. Virginia argued that Michael set the fire near the front door to block escape, and that proved intent to murder. Because the victim was under 14 years of age and Michael was more than 20 years of age, the location of the fire near the door proved not only intent to murder, it proved capital murder. Virginia therefore asked the jury for permission to execute Michael Ledford. To the left of the door is a light switch. It controls an outlet near the floor behind the couch. That outlet will be critical to the story. I will speak of it again in future posts. Directly behind the chair is a quilt rack. It has several quilts and an Afghan draped across it. The quilts and the Afghan will soon burn and add substantially to the fuel load. Above the quilt rack is a picture hanging on the wall. The photo captures just the very bottom of the picture frame. That picture will provide a clue. It will try to tell us something. I'm not yet sure what it's trying to tell us, but time and effort will reveal its clue. To the left of the chair is an end table, of sorts. The end table is actually a portion of the sofa in which the back cushion can be folded forward to form the end table as shown. On the table is a lamp with a glass base and a hooped shade that seems to be made of paper. The lamp is plugged into the outlet behind the sofa. If the lamp switch is in the "On" position, flipping the light switch near the door will turn the lamp on and off. There are several framed pictures on the table. I assume they are family photos. There is also a doily resting there. At the front of the table are two drinking vessels of some sort. They look to me to be one bottle and one tall can. I think they are inconsequential. They will be gone by the time of the fire. Not seen on the table are two taper in candle holders. They should have been there at the time of the fire if Michael's confession is to be believed. He said they were in candle holders. "They were candle holders that we got for a wedding present." He said they were on the corners of the table. "We're always careful of where we put the candles, but we just set them on the corners that night. ... We both did. I set one on the corner and she set the other." He said he then threw the candle in the chair and left. "After Elise went to bed, I turned the light on in the living room, and I told her that I would blow out the candles. I blew out the one, made sure that Zach’s door was closed -- that way he wouldn’t get hurt. I even made sure that our bedroom door was closed. I lit -- I kept the candle lit, and I threw it in the chair." We know that Michael was talking about the table beside the chair, because early in the interrogation, he suggested the candles must have fallen off the table and into the chair when he shut the door. "When I left, I shut the light, I turned the light back on and I'm pretty certain, up to this point in time, now mainly, because I was scared, that I did blow out the candles. But now I'm thinking that apparently I didn't and something caused one of the candles, at least one them to fall. That's the God honest truth." Perhaps the candles were placed on the table after the birthday party was over but before Michael left the apartment. We'll look at the photos taken after the fire to see if we can find evidence of them there. Below, I've included a photo taken after the fire. 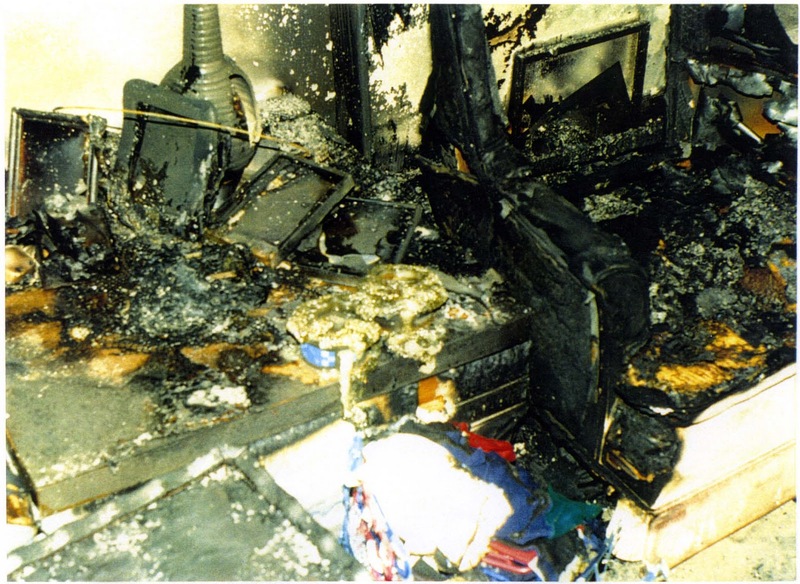 This photo was taken by the insurance investigator two days after the fire. The police investigator had moved the chair and quilt rack to photograph behind them. The police investigator or the insurance investigator had also removed almost everything from the table. The insurance investigator returned the chair and quilt rack to their positions during the fire, based on the markings left on the carpet. He also returned the lamp to the table before taking this picture. I've edited the photo only by making it lighter and brighter than the one I received. Click to enlarge. The tops of the cushions are burned, as are the tops of the end table and the coffee table. The front and the sides of the sofa and chair, at least those portions shown, are not burned. The polyurethane foam in the seat cushions is generally intact, unconsumed by the fire. The seat back, however, is completely gone. You can see right through where the back cushion used to be, and see the quilt rack. The rack remains. The quilts and Afghan are mostly consumed. The white case, possibly a sewing machine case, is out of place. The front door is open. The picture that had been hanging on the wall has fallen to the floor and is visible through the now empty quilt rack. There is no water damage from the fire-fighting effort. This fire burned rapidly and self-extinguished before the fire company arrived. It was an October night and all the doors and windows were closed. The fire used up the oxygen it needed to grow, that oxygen wasn't replaced, and the fire died out. Zachary was at that time laying in his crib in the children's bedroom. He was unburned but died of carbon monoxide poisoning. Elise was at that time lying on the floor in the master bedroom. She had been badly burned as she twice tried to get to the front door. She retreated to the bedroom, called 911, and collapsed to the floor just as the connection was made. One more photo and my point will be made. This is a closeup of the area taken the day after the fire by the police investigator. We can see the chair with the missing back, the quilt rack with the missing quilts, and the picture that has fallen from the wall. We can see what is left of the family photos. We can see the glass base of the lamp. It fractured from the heat. We can see a metal hoop from the shade and the remnants of the doily. The bottle and can that were in the previous photo had been replaced prior to the fire by two plastic drinking glasses. We can see them in the photo. They melted in the heat. The insurance investigator saw in person pretty much what we can see in the photo. From his report, we find this description. Examination of the debris on the table show the remains of a crocheted doily, a picture frame, the remains of two plastic drink cups, which are melted, a television or VCR remote control and various paper and debris. What we don't see in the photo, what the insurance investigator did not see when he stood there and looked directly at that table are candle holders, or melted candles, or candle wax. Neither fire investigator mentioned finding any candle, any candle wax, or any candle holder anywhere in the apartment. One might argue that the candles were consumed during the fire and that no candle wax would remain. 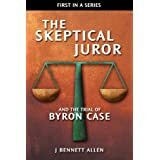 Virginia made that argument to the jury, and the jury apparently accepted it as fact beyond a reasonable doubt. I don't believe the argument is valid, and neither does Pat Ledford, so we will be conducting testing to resolve this issue. We'll report early next year on the results. What is not at issue, however, is that candle holders do not burn up in a fire while plastic cups sitting immediately adjacent only melt. There should be two candle holders on the table. One should be near each of the front corners of the table, where they would interfere with (and possibly burn) anyone reaching for a plastic cup. That's where Michael said they were, but I can't see them. Neither of the investigators could see them either. If Michael's confession was factual, where are the candle holders? Michael Ledford's confession began as denials that he had anything to do with the fire, that he had no idea how it started. I am telling you, I did not start the fire. I don’t know, but it wasn't me. The only thing I can say, sir, is do what you need to do but I am going to claim my innocence ‘til the day I die. I did not set the fire that took the life of my son and damned near took the life of my wife. There is no way in hell I'd have done that. If I deliberately set that fire, may God strike me dead now. I did not set the fire. I didn't set the fire. I didn't know where the fire was, plain and simple. No. I want you to leave here knowing that I'm telling the truth. I didn't set the fire. No, because I didn't set the fire. I think the fire was set accidentally. You can go to hell sir! For hours, Michael's story did not include any mention of candles, or candle holders. He was not the first to introduce those items into the interrogation. His interrogators suggested them, and Michael acquiesced, bit by bit. As his interrogators suggested various means and motives, as they lied about evidence tying him to the fire, as they promised to help him if he would only confess, Michael's story evolved to include a candle he thought he blew out, to a candle he might not have blown out, to a candle that might have fallen into the chair as he shut the door. Each time he tried to better explain what might have happened, the interrogators pushed harder and harder. Suddenly Michael seemed to accept that he had tossed a candle into the chair before he left. It was shocking to behold. He figured he must be crazy. He asked to be put in a mental institution. He lost all sense of reality. He believed he needed help, and he believed they were offering help. He was, at this point, clearly delusional. Okay. I want the agreement that I will be sent for, I want the agreement that I will be put in a psychiatric, a psychiatric hospital, to get the evaluation that I need. That's all. And afterwards, maybe help me get a trade -- not necessarily to make a good living at, but something where I will be away from people. At that point, and only at that point, did the interrogators elect to believe him. However, Michael's acquiescence became demonstrably false at the point when he began incorporating candles and candle holders into the events of that evening. One of his interrogators was, in fact, the very person who photographed the last picture I just presented. That interrogator / investigator absolutely did know (or should have known) that Michael was confabulating rather than confessing. Instead, that interrogator / investigator charged Michael Ledford with the first degree murder of his own son. And that is why I am interested in helping. Stay tuned for the next post in this series, when I show that Michael Ledford's confession violates not only basic thermodynamics, but space and time as well.